Peter has the title of “Security” at Workshops, but is so much more. He is the smiling face that greets staff, production workers, delivery folks, and visitors when they come to Workshops in the mornings and late afternoons. His melodious voice on the PA system lets people know when their ride is waiting, if they have a phone call, or any other general announcements. His voice makes a fire drill sound like an invitation to a gala. Every delivery person, mail person, bus driver, and Workshops neighbor knows Peter and makes a point of waving and calling out to him when they go by. Originally from Selma, Peter has been at Workshops since 2004. He came to us through the Department of Vocational Rehabilitation. He started working in what was then our mailing room, then became a materials handler. 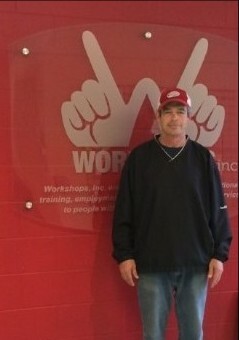 Peter eventually was Workshops’ truck driver, and finally in 2010 he took on his current position of Front Desk/Security. During his time at Workshops, he faced numerous health issues including undergoing dialysis and eventually a kidney transplant at UAB in 2011. You would never guess he had ever had a health issue to see him patrolling Workshops in the afternoon. He has two grown sons and a daughter who is a rising senior at the Jefferson County International Baccalaureate School. In his spare time he like to exercise – especially walking – and follows the Miami Heat and the Pittsburgh Steelers. We are lucky to have him as part of Workshops! Be sure to say hi the next time you come to Workshops. Susan first came to Workshops, Inc. to go to school. When she finished high school, she stayed. And we are so glad! Very quickly her supervisors saw that she is meticulous, detail-oriented, and learns and masters tasks quickly. 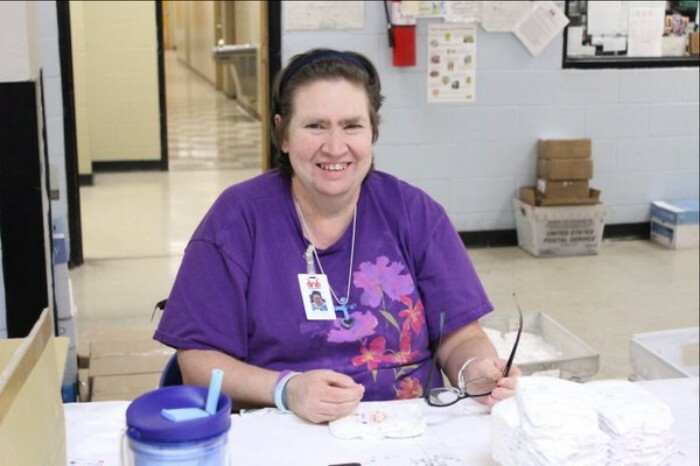 Current Director of Operations Kathy Dunn loves having Susan as part of her team because she can move easily from one detail-oriented task to another with a minimum of instruction or supervision. Susan's dedication is legendary! Earlier in her time here, she rode a special bus to and from work. If the bus to take her home was early, she would refuse to stop working, saying she had to finish her shift and would have to find an alternative ride. She also takes great pride in the trust Kathy puts in her. Susan says with a smile and a gleam in her eye, "I keep learning how to work. Kathy says I can do the work better than her!" But Workshops is just part of Susan's busy life. She never lets her disabilities keep her from fun! Each summer, she spends a week at camp and makes sure she tells everyone when she is going and shares stories and pictures when she comes back to work. But the greatest passion in her life, outside of her work and her family, is square dancing with the Birmingham Square Dance Association. 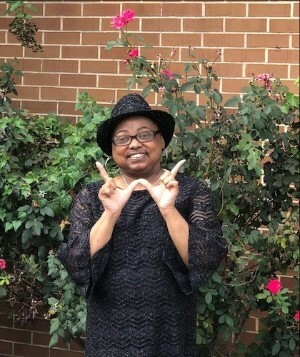 She loves to tell stories of her square dancing fun, including tales of her Uncle Ronny who is a caller for the group and loves to play tricks on her during dances. 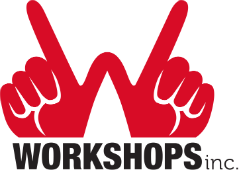 Come visit us at Workshops, Inc. and ask Susan to tell you all about it. Don came to Workshops from the Jimmie Hale Mission. He was there to overcome addiction so he could get his life back, including being able to spend time with his teenage son. Don chose Workshops, Inc. when he reached Phase 2 of the Jimmie Hale program, where participants go back into the community to work. Don said he liked that Workshops was flexible and understood when he needed to go to meetings or to doctor's appointments. Don worked in every department at Workshops, but all of us will remember him best from his time on the housekeeping staff, where he did a good job and was always an upbeat, friendly co-worker. He would jump in to help in other ways, too. Once, we had desk drawers that were stuck shut. Three or four people tried and couldn't get them open and had almost given up, when Don gave it a try. He took the time to analyze the situation from every angle, then it took him about 3 minutes to get it open. We think Don has an engineer's brain! While he was working at Workshops, he also had another part-time job with a previous employer who invited him to come back full time when he was ready. "Instead of doing what Don wants, do what God wants."